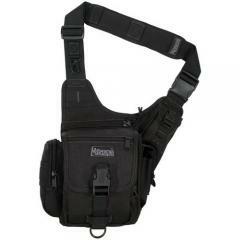 The Maxpedition Fatboy Versipack is a large single-shoulder bag designed for right-side carry. Its main compartment provides extensive storage space, and includes a drawstring storm collar that keeps water out. The rear slip compartment features a loop field, allowing you to attach a concealed carry holster or other CCW accessories in a strong side or crossdraw position. Additional external pockets make it easy to store and organize smaller equipment, while the two external nylon webbing anchors support modular accessory attachment. The bag's adjustable single-shoulder strap comes with a non-slip shoulder pad that makes it comfortable to carry, as well as a removable waist belt that provides additional stability during movement.